If there’s one thing I don’t spend a lot of money one, it’s usually steak; it’s pretty “rare” around our house. (Ok, I have a rule, only one bad joke per post, so it’s safe for you to keep reading, now.) And if I do splurge, it’s not your average dinner night. That doesn’t mean, though, that we don’t have Steak every now and then. Or every once in a blue moon, Beef Tenderloin. And that’s when I want to make Medallions of Beef with Red Wine Reduction. These Fillets are thin, only cook them for a minute or two! Long before I ever saw Alton Brown suggest buying a Beef Tenderloin from a buyer’s club and show how to trim it yourself, I’d already figured out that if I watch sales very closely, certain times of the year I could pick up a whole tenderloin for even less than that at the buyer’s club. And guess what? Before Valentine’s Day is one of those times, and so is before New Year’s. I’m not kidding that it’s a bit of an expense, but I have found it for as low as $6.99 a pound. There’s no doubt that those tenderloins aren’t USDA Prime, and they’re going to be a bit scrappy, probably not the full four to five pounds of a prime cut, and they’re going to need some trimming and tying, but that doesn’t mean they aren’t going to be absolutely delish! You might want to see Buying and Prepping a Tenderloin, Beef or Pork, In the meantime, I want to talk about this insanely good recipe that I usually make from any scrappy beef tenderloin or the scraps trimmed from a better one because you don’t want to waste a single ounce of this pricey beef. When you’re talking fancy, over the top dinner, you can never go wrong with filet mignon, which is sliced from the tenderloin, or in this case, as they’re called a “medallion.” Then there’s the wine sauce. It’s just as crazy good as you can imagine it is! And when that sauce is a reduction, it’s going to be a glossy, rich beautiful thing…you’re gonna want to lick your plate. Just don’t do it when anyone is looking, lol! Or better yet serve your meal with a little five-minute no-knead overnight Crusty Bread to sop up that sauce…but not while anyone’s looking! Adapted originally from an Epicurious Recipe, featured in Bon Appetit March of 1996, this has been a go-to “Special Occasion” Dinner at our house for ages. When I made them today, I was helping my son Kraig out with a dinner to share with his girlfriend, Tweety. This is the perfect romantic dinner! I’d serve these with the most marvelous Pureed Parsnips, Bacon Brussels Sprouts, and Mushrooms Dianne. Bon Appetit suggested serving over noodles. You can see how this might be confused with Filet Mignon. Since Medallions of Beef with Red Wine Reduction calls to very lightly pound 1/2″ slices of beef into medallions about 3/8ths thick, they’ll be slightly tenderized. They’re then “flash” cooked – seared off very quickly in a hot, hot pan and they’ll only be cooked from rare to medium-rare. You’ll practically turn it in the pan and it’s done, although you’ll need to keep in mind it will continue to cook even after it’s removed from the pan from the residual heat. The sauce is simmered in a separate pan and then added to the pan the beef is cooked in so it picks up all that flavor; the sauce will probably take a bit longer to reduce than the steaks take to cook, so start it ahead just a little. This gorgeous, quick cooking method is great for the very tender filet mignon, but also is a great way to cook steaks that are much cheaper; slicing thinly, slightly pounding and flash frying until just rare to medium rare means even a tougher cut is going to be ok. It certainly won’t get any tougher! As far as saving money even, on this expensive cut of meat, it IS possible to find a budget tenderloin or a budget Filet Mignon. If the price seems to good to be true, though, it probably isn’t Filet Mignon. So let’s say you picked up a package of Filet Mignon to celebrate Valentine’s Day. But what if you just thought you bought that pricey cut at a great price and when you opened the package it wasn’t what you expected? The lovely bacon wrapped Filet is firm and dense! Be careful and watch the wording on the package. The package probably says simply “Filet” or maybe even “Steak” and it’s very likely that the price of these “filets” is going to be a lot less than filet mignon, but will cost a lot more than you’d pay per pound for the cut you are buying – that is if it weren’t packaged up to masquerade as Filet Mignon. Even seasoned cooks might fall for this now and then, so if the price is too good to be true, trust your instincts. What you are probably looking at is the very dense, prone to be tough and chewy Eye of Round wrapped up in bacon. Although the eye of round is a tricky steak, and it will never be butter knife tender, this recipe might even save that steak. And of course, it’s going to be even better with tenderloin. Cut tenderloin into 3/4 to 1-inch pieces. Pound beef rounds to flatten to generous 3/8 inch thick medallions. Season lightly with salt and pepper. Set aside. Add two tablespoons butter to a saucepan. Add onions and thyme; sauté until tender, about 3 minutes. Add garlic and saute for a few seconds longer. Add flour; stir 1 minute. Add broth and wine. Boil until sauce thickens and is reduced to 1 1/4 cups, stirring occasionally about 12 minutes. Melt 1 tablespoon butter and olive oil in heavy large skillet over medium-high heat. Working in batches, sauté beef in skillet until brown on the outside but still pink in center, about 1 1/2 to 2 minutes per side. Transfer beef to plate. Add sauce to the skillet; if it’s been sitting for a moment, reheat. You’ll notice it slightly thickens as it’s added. Don’t bring to a boil, just gently reheat and add any juices from the resting beef and stir in. Arrange medallions on a plate, add a little sauce, sprinkle with parsley if desired. Note: If your beef is wrapped in bacon, chop it up and in the pan you are making the sauce in, add the bacon. Cook until rendered and crispy. Then proceed with the recipe using the bacon drippings instead of the butter. If you don’t have enough drippings to measure 2 tablespoons, add butter to make up the difference. Sprinkle the bacon over the top of the finished dish. This entry was posted in Click here for Bargain Meals, Click here for Fabulous Food Posts and tagged Alcohol, Beef, Beef Stock, Beef Tenderloin, Round Steak, Steak, Wine. Bookmark the permalink. Thanks so much. I wanted to pull out all the stops for Valentine’s’ day! 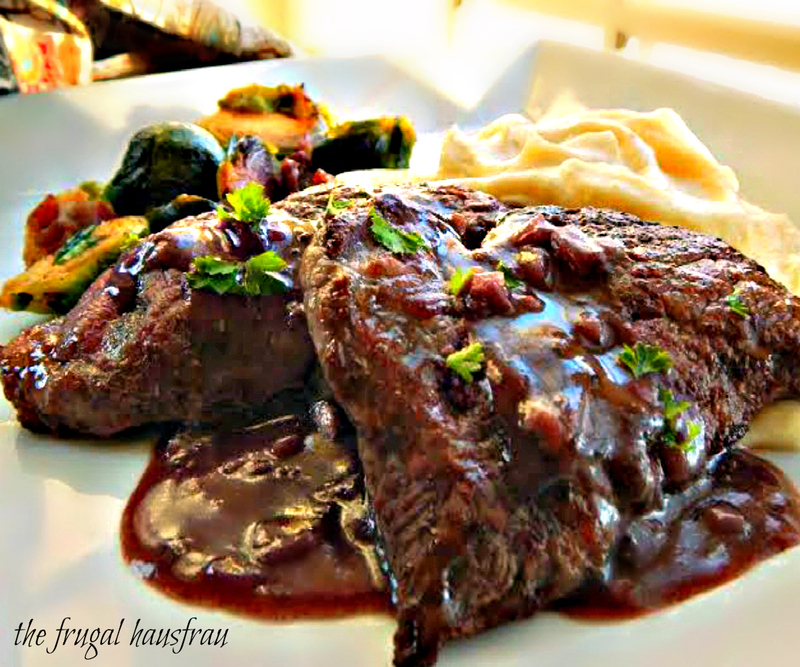 Wow, love the medallions in the wine reduction, what a lovely dish to bring to the party. Thank you for bringing. Thanks, Suzanne. There was a back story,too. Child number 2 took part of the Brussels, Wine Reduction and Mushrooms, and we stopped on the way for better steaks and baking potatoes so he could make a gourmet meal for his g/f. He went all out, a necklace, flowers, balloon and chocolate! Yum, . . . not frugal for tenderloin, but still great that it’s on your blog and that you made this dish to share with us at FF this week! Have a fabulous weekend! 🙂 You’re so right! Imagine, though, what this would cost if you went out to a restaurant for the dinner; I shudder to think. Sometimes it seems ridiculous except when you’re dead tired and don’t feel like cooking or cleaning ! I have always seen red wine reduction on menus, and always thought it would look classy! You’re too kind, CCU! It’s marvelous and you might notice, if you don’t dump it into the pan the steak was cooked in, has no meat products! Just use a tablespoon of butter to finish it off by turning off the heat and slowly whisking as it melts. It was so good with the parsnips and would be marvelous over many, many things! Nice way to deal with a tough cut of beef. I wish you could have been here = much better with tenderloin, though! !